One has not always to be a great artist or show huge craftsmanship to produce an interesting deck worthy to be collected, proof of that is this self published deck very limited edition (only 50 decks where created). 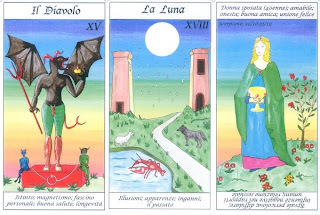 Early this year she released her “I Tarocchi della Notte” (aka Tarot of the Night) this seems to be her next brainchild (that could be translated as Tarot of Colours and dreams). 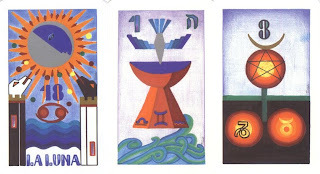 There are lots of similarities with that deck in style and structure (and they both have non-scenic pip cards) but where the previous was clearly inspired by the Papus tarot this one seems more like a personal interpretation of the Tarot de Marseille. Where the naïve style images may irritate, bore or even appal some people they have character something that can not always be said of the highly polished commercial decks – pretty but dead…. What misses Franca is lacking in the highly skilled artistic field she makes more than good in insight into the tarot tradition, this is a deck that would make proud the big names of old but also I’m sure the modern stars & teachers. There are many themed decks, decks build around a theme be it art, animals, herbs or bygone era’s (think of the dozens of Egyptian themed decks), but to my knowledge there is only one clown cantered deck and that is this one! 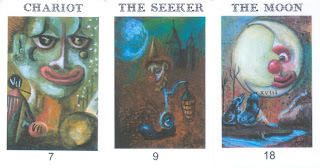 Many themed decks lack in consistence, to match the chosen theme, but not this one, the images are not yet another copy op the images by Pamela Coleman Smith but with clowns. 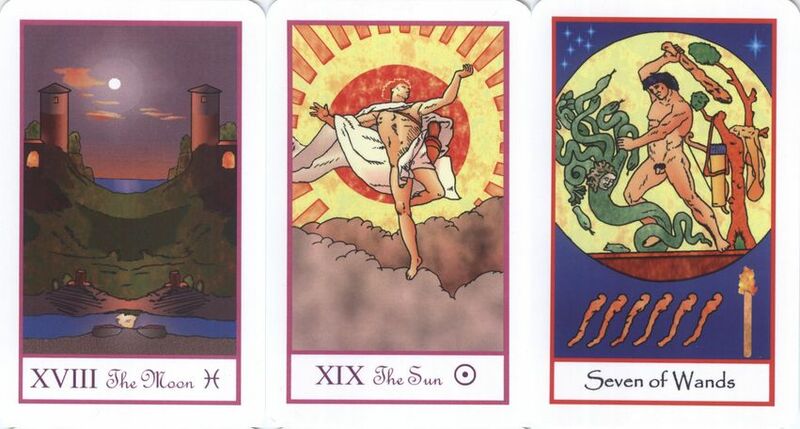 The images in this majors only deck are truly original and the clowns are not all happy but further flat emotionless beings but display a wide range of emotions from the sweet innocent to the sad. The settings are sometimes a bit bizarre and surreal and sometimes your looking at them and go Ooo yes indeed it is….indeed they work within their chosen format and within the broader tarot tradition stand tall and strong on their own. One can find sometimes interesting overlooked decks. And the Asian marked is often overlooked by many, one has to say there are many many manga-style decks in Asia and if one does not like those you don't pay much attention to the entire market as a consequence. But sometimes there are decks that are really different and worth looking into it like this one. 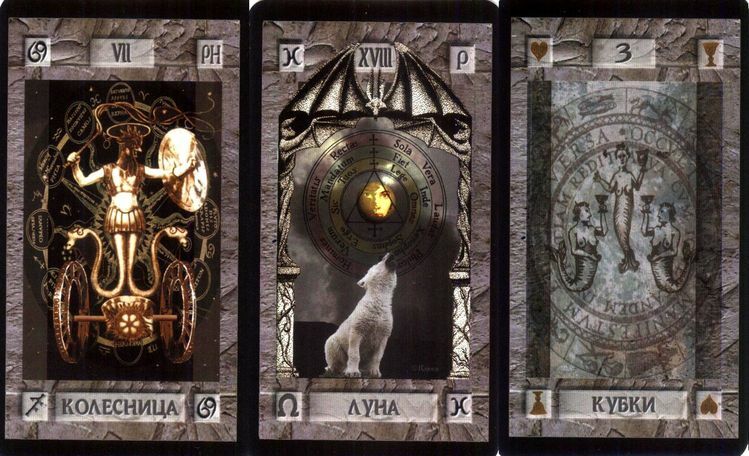 While being printed in Asia it does not feel Asian, the persons depicted in it look Caucasian, the imagery is dark-fantasy and the language is ....Greek (the only deck in my collection of 1000+ decks that is in that language). 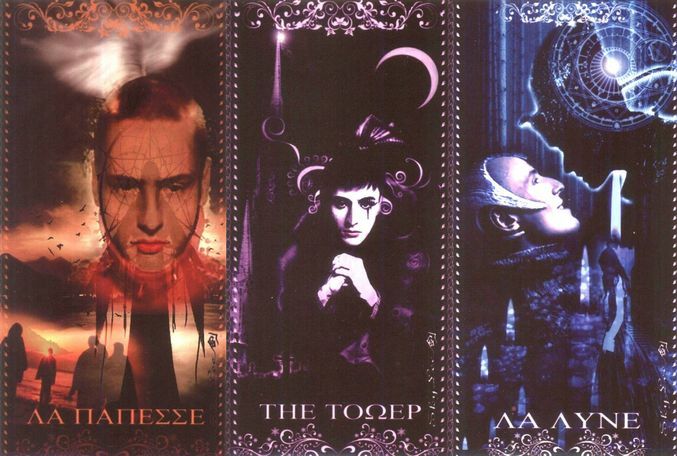 The way the artist depicts the archetypes is fresh and original - original enough to give me for some cards difficulties enough to match the images to a title, i even had to look the titles up using google-translate to be able to match them all. 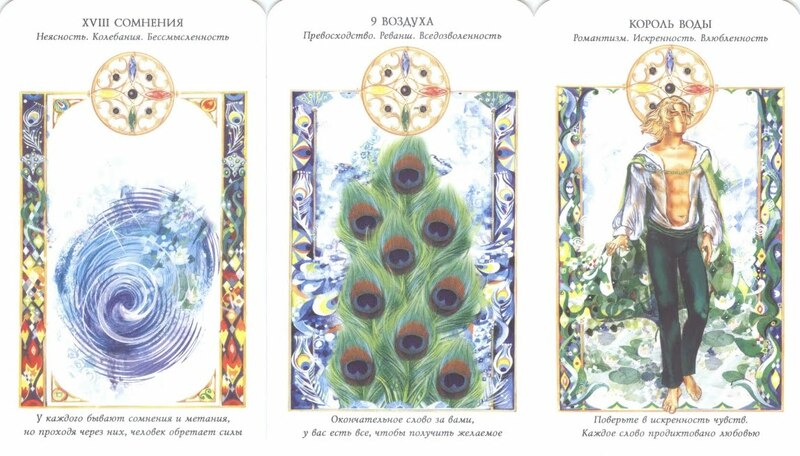 With this deck we are back to Russian tarots and to the real of the surprising strangeness (if that is good or bad is up to each individually to say). What I was able to gather about the deck was that the cards are created to help you learn all about the interaction of male and female energies, which govern the flow of events and the state of the human world. The 56 minors tell about the role that elements play in your life: the freshness and fluidity of water, heat of fire, transparency and freedom of the air or the hardness and reliability of the Earth. Hence the elements of its title. In all it’s unconventionality it’s nice deck to look at, nice sized and good quality of both printing and cardstock – possibly great for meditation or creative work. Yet again a small break from posting my Russian aquisitions, this time it's one of those modern TdM variations i adore and loveingly call Neo-Marseille.It's a full 78 cards deck with recognessable images and a true TdM structure executed in an angular almost entirely geometric style. Althoug modern it is not really a "new one", it was published in 1989 in a big limited edition of 5000 decks as promotion for Italtel (a major telephone provider in Italy) The deck is bigger than most decks at at approx. 3-1/2 x 6 inches and that combined with it's stong colors and silver and gold ink (not gilded!) makes it a deck with a strong personality that stands out wherever you put it. Back to Russia so to speak, and with a deck that screams it's name MAGIC the whole deck breaths an atmosphere as it where created to be used by a grand mage, a Voodoo priest or at least someone playing these in a movie of soap. A formula that seems to work as this deck is already at it's third print-run (Published by KSP+ in 1999, 2003 and now in 2010) This new edition has been very slightly restyled by fitting it with very dark blue/black borders giving it an even more 'occult tool' look. This collage deck combines in an harmonious and apparently seamless works of classical art, magical elements and in the minors own drawings giving an own reinterpretation of the WCS ones original and yet easily recognizable. As to it's structure? Well although being a Russian deck this one is completely similar to a 'normal western' tarot 78 cards divided in 22 majors, the 4 classical suits and yes even the classic court cards page, knight queen & king are all there, except it being in Russian the whole deck could as well have been printed in Europe or the USA . Taking a 'small brake' from the Russian decks - i love to mention this deck by tarot writer, blogger and all round well rounded person James Ricklef. Already to his third small limited edition run it is very well worth having a look into, and perhaps get one now you still can. 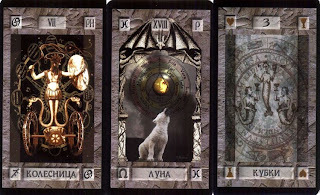 The deck has as starting points great masterpieces of classical art and links them to all 78 tarot archetypes, indeed we recognize paintings by Toulouse-Lautrec, Rembrandt and Hieronymus Bosch. But different than other decks who are based upon classical art James takes them and does his 'thing' to them redrawing them in n pen and ink and colored on the computer, giving all cards in the deck an uniform feel and look, something - in my humble opinion - he has very well succeeded in doing.